The biggest hurdle seniors have in adopting technology is not the learning curve, but the agility. We tend to blame elders for not adopting the technology by building interface for youngsters and expecting elders to use it. At Cooey we started thinking deep into shortlisting a right interface for the elders. After some serious consideration, it was conclusive without doubt that it is VOICE which can be used as the right interface, you know they love talking. There is no better time in history of technology to implement such a solution (it was 2 years back). Maya was the result of applying simple principles of interface design and AI. For large part of our existence, we used body movements, hand gestures, facial expressions, and changes in our voice to communicate with each other, but as we moved on writing or text became part of our communication. Soon technology made things simpler for us, we found great utility in computers & smartphones. Then, keyboard, mouse, touchscreen all became an integral part in our day to day life. Human interaction with machines has been the history of technology. For long, we watched the characters in Hollywood movies visualizing possibilities where humans talk to machines just as you speak with your family and friends. Lo and behold, that turned out to be a reality with the arrival of Apple’s Siri, Google assistant, and Amazon’s Alexa. With the number of installed internet of things (IoT) device units set to go past 26 billion by 2020, machine-to-machine interaction too is going to be dominated by voice. And that’s what Maya brings to the table! Your voice-controlled personal assistant with a difference. 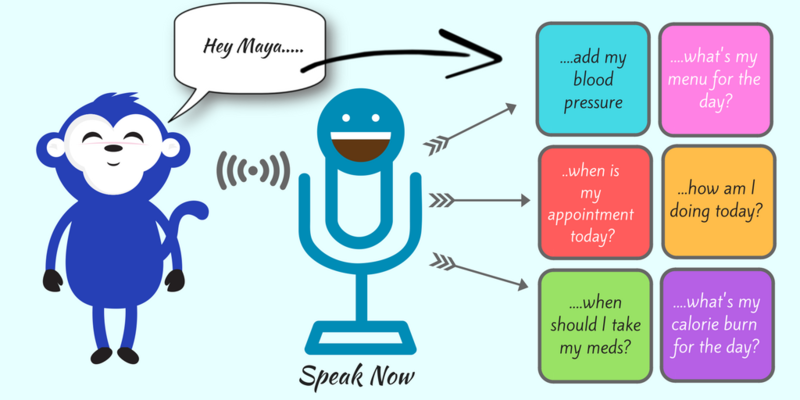 Maya simplifies routine health monitoring tasks with simple voice commands. Voice interfaces allow its users to ask questions and receive answers through a natural dialogue. Her functions are available to use with any device, at any time, to interact with any application. 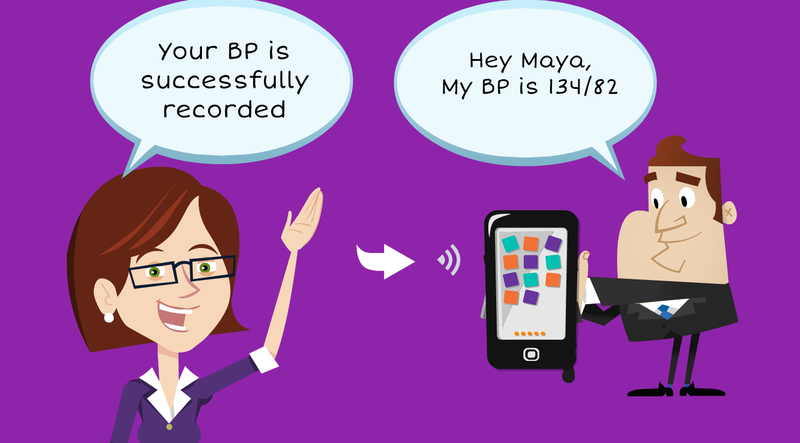 For example, you measure your blood pressure or blood sugar, all you need to do with Maya is to tell her “my blood pressure is …. or my blood sugar is …., etc.” and she does the rest, meaning by she records your health vital in the logbook of your smart phone application with the timestamp. OR if you have a device that speaks up your vitals, Maya can be configured to take that request as well. 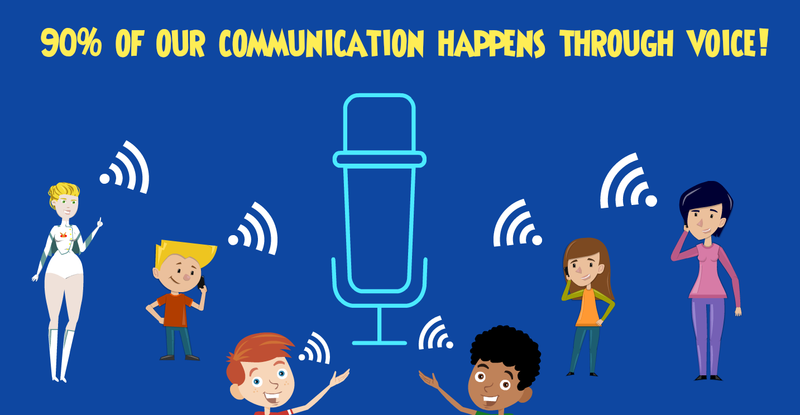 Ninety percentage of human communication still happens through voice since it’s natural. At a normal speaking pace, an average person speaks approximately 145 words per minute. With highly optimised algorithms, Maya makes it possible for you to use voice control on your device, and obviously, it is something you could accomplish faster than how you would have done it manually. With machine learning and cognitive systems as the driving force behind this technology, it’s impact in future applications can be colossal in the days to come. Being chronically ill can be embarrassing! Day in and day out, we do see our near and dear ones go through the painful process of logging their health vitals. It can add to the worries if you are someone who stays away from them and you realize they have done so much to take care of you and support you. With Maya around, probably, there is much more you can accomplish to support them and help them enjoy a good quality of life. Maya empowers you with full device control in addition to using the functions in your installed applications. You need not launch a separate application to execute your voice commands. Maya wakes up to help you as you see fit, no matter where you are, what you do… and she gets the job done for you with simple voice commands. Recently we integrated Alexa with Maya to make it even more powerful, you can find out more about it here. As these skills catch up, your voice is going to be the universal interface of your home and could well be a positive trigger for a healthier behavioural change!